In 1872, before the end of Reconstruction, Republican Ulysses S. Grant won a popular majority in the South, though not in Texas. Until 1952, almost without exception, the "solid South" gave clear majorities to Democratic candidates. The major exception was 1928 when New York Governor Al Smith, a wet northeastern Catholic, lost Texas--as well as Florida, North Carolina, Tennessee, and Virginia--to Republican Herbert Hoover. In 1948 the Dixiecrats, led by Strom Thurmond, bolted the Democratic party winning Alabama, Louisiana, Mississippi, and South Carolina but not Texas. The rest of the South went for Democrat Harry Truman. In 1952 Republican Dwight Eisenhower had enough appeal to draw some southern states to the Republican column, including Texas which went for Ike in 1956 as well. Like most other southern states Texas turned firmly Republican at the presidential level when it went for Nixon in 1972. 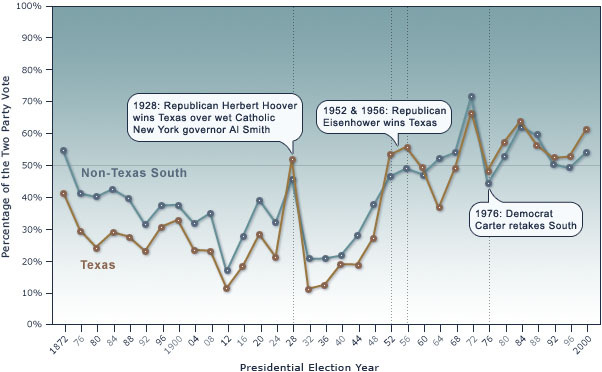 With the exception of support for Georgia Democrat Carter in 1976 on the heels of Watergate, both Texas and the South have supported Republican presidential candidates since then.